Today I went through the next thing that has been on my mind: my purse collection. I have a tendency to keep my old purses when I get a new daily bag, plus I have some that I was only using for special occasions -- which turned out to be only a couple of times a year. I'm not really all that focused on fashion anymore, though, so I got rid of most of my "dress up" purses. They were hand-me-downs from a friend and not really very "me" anyway. I also found a random winter hat and pair of gloves that I had gotten from Walgreens ages ago with a matching scarf. I like the scarf, but not these, so they'll go too. 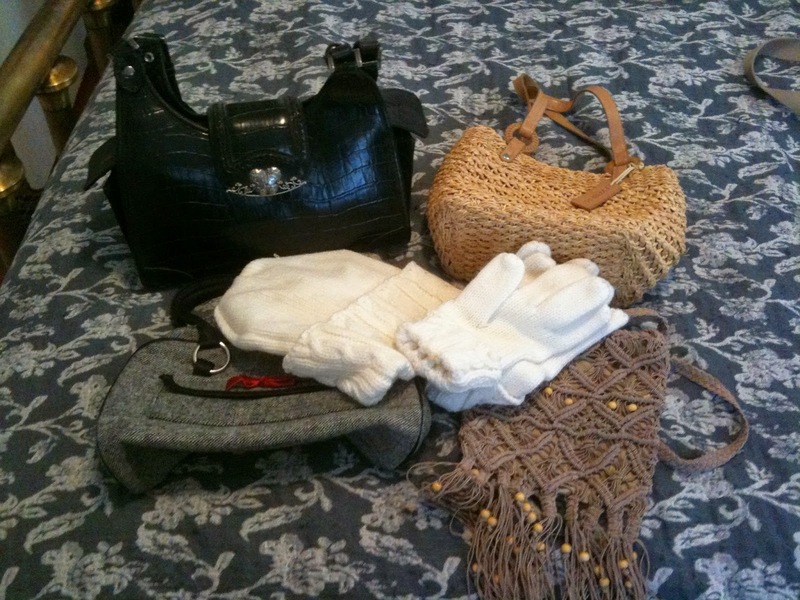 The four purses, hat, and gloves are all going into my Goodwill pile. When I get a decent pile together I'll catalog and photograph everything, then drop it off at Goodwill. We usually itemize on taxes, so I always keep good records of this kind of thing. As I said, I tend to keep my old daily purses. I do sometimes go back to them, and I decided today that I'm going to try to reuse a couple that I still have and like. Both are dirty and one needs to be sewn (though it's an easy enough fix, I think). One other might be able to be cleaned as well. All three of them have held up better than my current purse, though, which is why I think I'll try to salvage them -- but if that goes well, my current purse will soon join its brethren in the give-away pile!